Northwest Fine Art Printing is a subsidiary of Diversified Systems Group Inc., which has been in the printing industry for more than 35 years. 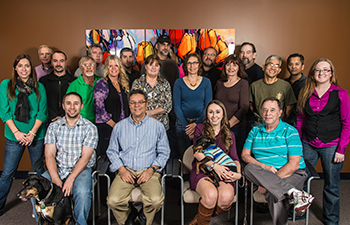 In October 2009 DSGI expanded its family business to include NW Fine Art Printing. Located in the beautiful Pacific Northwest, NW Fine Art Printing boasts the only G7 Certified Color Expert in Washington state, Matthew Sambrook. We are YOUR local experts on fine art and photography printing. Whether you’re a professional artist with discerning clients, an amateur photographer aspiring for recognition or simply a proud parent with special memories you want to preserve, we make it happen. NW Fine Art Printing is a family owned and operated business and what family is complete without a pet? At NW Fine Art Printing we love our pets which prompted us to donate a portion of our proceeds to the ASPCA. We also support the Wounded Warrior Project and the Leukemia & Lymphoma Society. Watch for special promotions and coupons that benefit these organizations on our website and social media outlets. At NW Fine Art Printing we are committed to keeping the earth and our prints beautiful and healthy. Our inks are aqueous (water based) and do not emit odors or affect air quality. These inks are also free of Nickel (Ni) PFOS, PFOA and VOC’s. This is not only good for the environment, but your prints will last longer due to the lack of harmful chemicals which are often the culprit of yellowing or degradation of prints. We also actively re-use and recycle our shipping boxes. The boxes we do buy are made locally from recycled paper.